Well, it's happened. Spring has finally sprung. The Toronto area has experienced double-digit temperatures for a few consecutive days now, so I'm feeling confident it's time to celebrate. Off come the socks, out goes the patio furniture and on goes the BBQ! This is probably the first winter in a long time that we haven't used our BBQ -- it was just too, too cold. But I've been craving some grilled goodness, and I'm not the only one. Hubby has become quite the grill-master over the years, and we love coming up with new recipes. Here's the thing: BBQing is great, but meat (specifically red meat) is expensive. So, we're always looking for ways to savour the grill and keep some money in our pockets. I think we found the perfect way: Beer-ific BBQ Chicken. 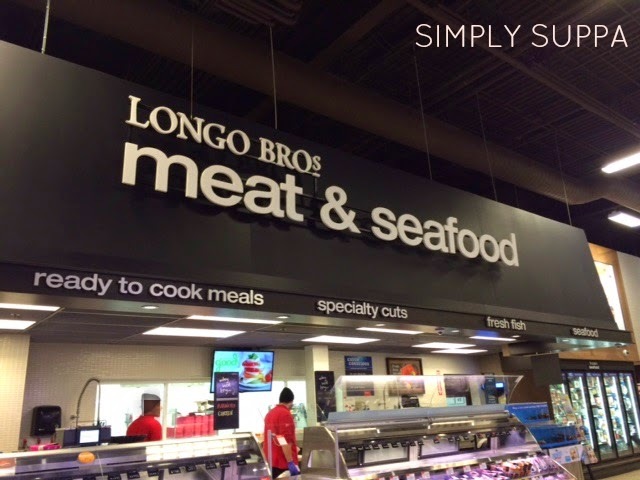 We do most of our weekly grocery shopping at our local Longo's. 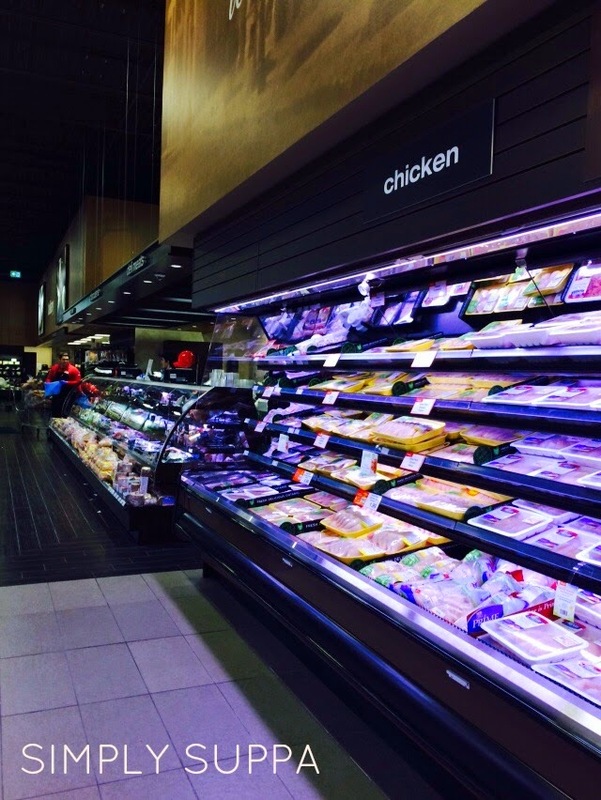 I'm mainly a perimeter grocery store shopper, and tend to stock up on lots of fresh produce, meat and seafood. I find this supermarket gives me a lot of options, and has a decent organic section, too. 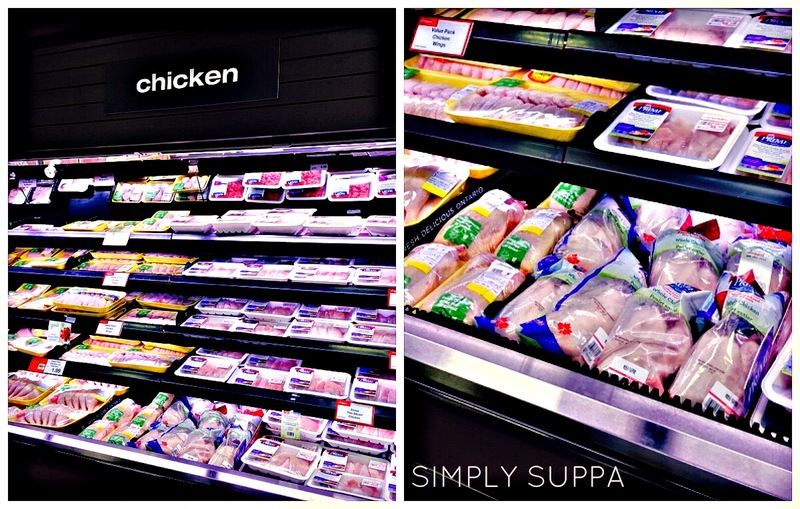 This week, chicken was on sale, specifically whole chickens. I had never cooked a whole chicken before, but the price was right. At $1.99/lb, we were able to buy two whole chickens for $13.15. That's just a little over 6 bucks each, if you're doing the math. So now, what to do with them? Turn it into soup? Make chicken cutlets? Stew? Cacciatore? I have to credit hubby for this one -- he wanted to try Beer Can Chicken. 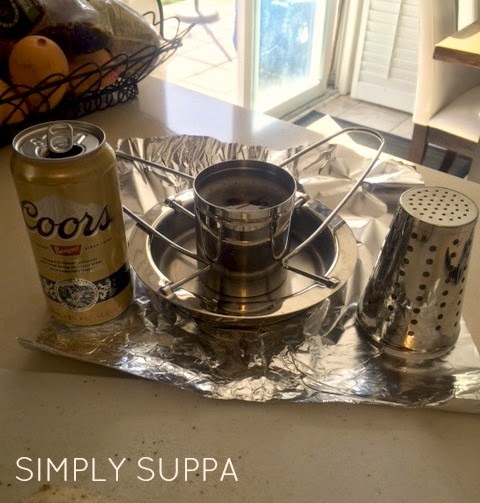 We didn't actually use a beer can for this recipe, but we did use about half a can of Coors Banquet, although any beer will do. Option 1: Place your whole raw chicken onto an open can of beer. Option 2: Use a handy-dandy Beer-Chicken caddy, like we have here. They can be purchased at specialty kitchen stores. First, coat the chicken with olive oil and rub, rub, rub. Then, apply your mixture of salt, pepper, onion powder and garlic powder and smooth it all over your chicken. 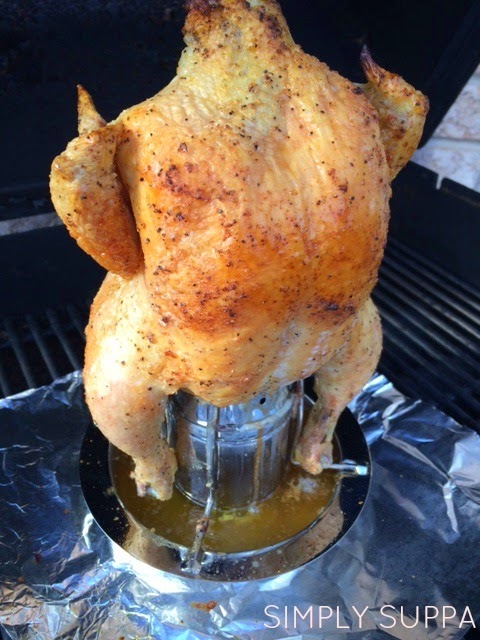 If you're using the caddy, fill the canister with beer, put the lid on top and position the chicken. 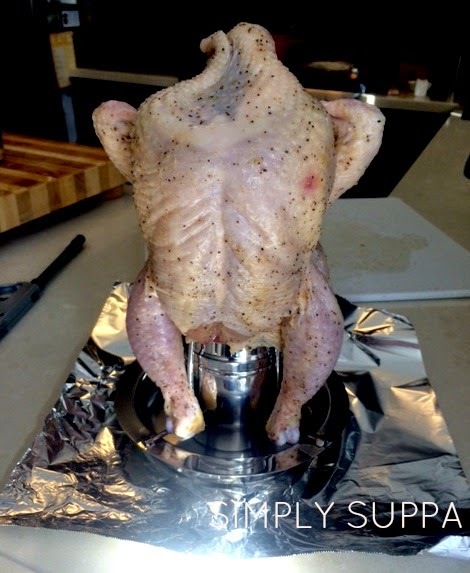 If you're simply using a can, opt for a taller can and position the bird atop. Either way, place tin foil or a BBQ-safe roaster underneath for drippings. Heat your BBQ to 375 degrees, or medium. Once hot, place chicken onto the grill with tin foil underneath and close the lid. Set your timer for an hour and you're set. Prepare your sides, spend some more time in the garden, play with the kids. Either way -- the majority of the "cooking" is done. Once golden brown and crisp, it's ready! Allow your chicken to rest for 15 minutes before carving. Of course, serve your Beer-ific BBQ Chicken with your favourite summer accompaniments -- we went with corn on the cob, grilled veggies and an ice cold beverage. The chicken was deeeelish; it was crispy and crunchy on the outside and moist and super flavourful on the inside. It makes great leftovers, is easy to serve and perfect for kids. And the grand financial total? About $5-7 per person for a stellar summer meal. 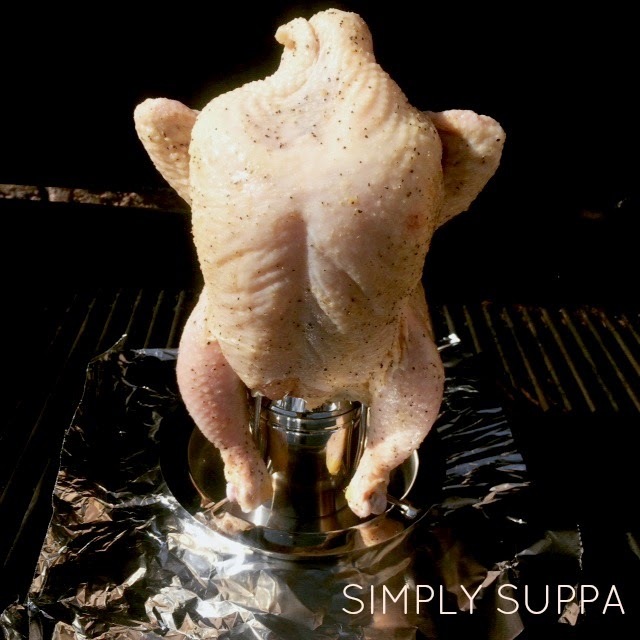 If you're having a summer BBQ this #VictoriaDay Long Weekend, or some other time this summer, why not forego the steaks and ribs and opt for a whole chicken? What's your favourite BBQ meal?